I made these individual trifles to have when my Mum came over for lunch, on the day we put up the Christmas tree. I always have a very romantic notion of ‘putting up the Christmas tree’, and the reality is always far more chaotic, with this year being no exception. 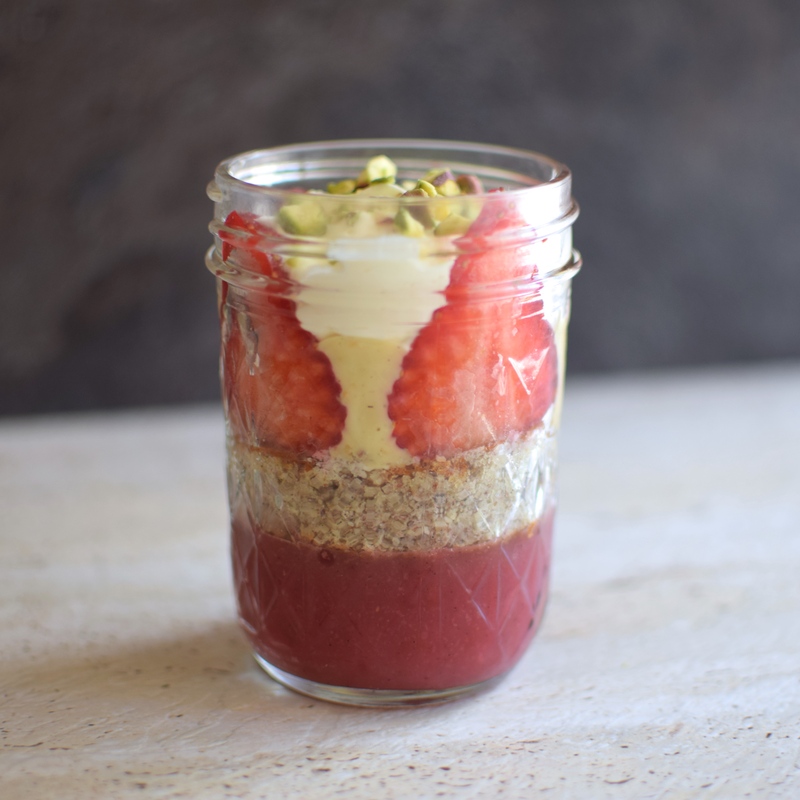 But these trifles are fructose-friendly, and by happy coincidence also grain, gluten and dairy-free, so they are also suitable for those living a paleo lifestyle. They are also very adaptable, so take or leave or change whichever layers you want to! 🙂 For vegetarians, the jelly could possibly be substituted with a berry chia pudding – noting that I haven’t tried this. It is best to start this recipe a day before serving. Other serving ideas: shredded coconut, berries, cacao nibs or grated 85% chocolate. 1. To make the jelly: Puree the raspberries in a food processor until smooth. If using frozen raspberries, you may need to add a little hot water. Push the mixture through a sieve to remove the seeds, and place the puree in a 250ml measuring cup. You will have about 1/3 – 1/2 cup of puree. Stir in the vanilla powder. Top with boiling water to a full cup (250ml). Add the gelatin and whisk like mad until it has completely dissolved. Distribute between the serving glasses. Now is the time to add extra chopped fruit, berries or nuts if you want to add texture to the jelly. Chill in the fridge until set. 2. Meanwhile, make the almond sponge: Preheat the oven to 180 degrees celsius, and line a small cake tin with baking paper. In a food processor or using a whisk, combine the almond meal, egg yolks, rice malt syrup, vanilla powder, baking powder and salt. In a separate bowl, beat the egg whites until stiff peaks form. Fold one-third of the egg white mixture into the almond meal mixture, to soften the batter. This might take some time. Once it has been incorporated, very gently fold the remaining egg whites into the cake mixture. Pour into the prepared tin and bake for 20 minutes until a skewer inserted into the centre comes out clean. Cool on a cake rack. 3. To make the custard: Heat the almond milk, orange zest, vanilla powder and rice malt syrup in a saucepan until near boiling point, and remove from the heat. Whisk the egg and arrowroot flour in a separate bowl until combined. Slowly pour the hot milk mixture over the egg while whisking. Return to the saucepan and cook over a low heat, stirring, until the mixture has thickened. Remove from the heat and allow to cool, before transferring to the fridge to chill completely. 4. To assemble the trifle: Cut rounds of the cooled cake* and push into the jars on top of the jelly layer. If using strawberry slices, place them on top of the cake, and press them against the side of the glasses. They should stick a little. Sprinkle in a few chopped pistachios, to add texture, if you like. Carefully spoon in the cold custard (which will help the strawberries to stay in place), and chill until ready to serve. 5. To serve: Top with the whipped cream and chopped pistachios. Other serving ideas include shredded coconut, berries, cacao nibs or grated 85% dark chocolate. Note: To make whipped coconut cream, place an unshaken can of coconut cream in the fridge overnight. Remove the can, turn upside-down, and use a can-opener to open. Tip out the liquid (reserve to use in smoothies), and you will be left with a thick layer of coconut cream. Scoop it out and whip using a hand-beater or food processor, just as you would for regular cream! Store in the fridge. *Got leftover cake offcuts? Store in an airtight container to eat within a couple of days, or freeze them, to use later in a quick dessert with yoghurt or cream and berries.